As winter shakes of its chilly coat, the meadows, lakes, rivers and trees around Le Chèvrefeuille make way for the fresh, new, delectable, light flavours of spring. Traditionally in the French kitchen, the arrival of spring is marked by a shift from the heavy, rich flavours of winter to lighter, simpler foods, which better suit the warmer weather and energetic lifestyle of spring. Some of the special spring treats local to the Perigord Noir are fresh trout from the Dordogne River, which we are lucky enough to receive every other week from a local fisherman, and our local farmers markets start to fill with spring treats: sweet new peas, broad beans, asparagus – both green and white, wild garlic and green dandelion leaves. Chef Ian took some time out from the kitchen to tell us what he loves most about cooking in spring. Q. What’s your favourite dish to cook in spring and why? A. My favourite spring dish would have to be green and white asparagus cooked lightly in salted water, topped with hollandaise sauce and a fresh, free range, organic poached egg from our very own Le Chevrefeuille chickens – simply lush! Q. What is your favourite spring food? A. I’d have to say asparagus. White asparagus is a specialty of this region, grown in Carsac-Aillac, about half an hour east from Le Chevrefeuille. 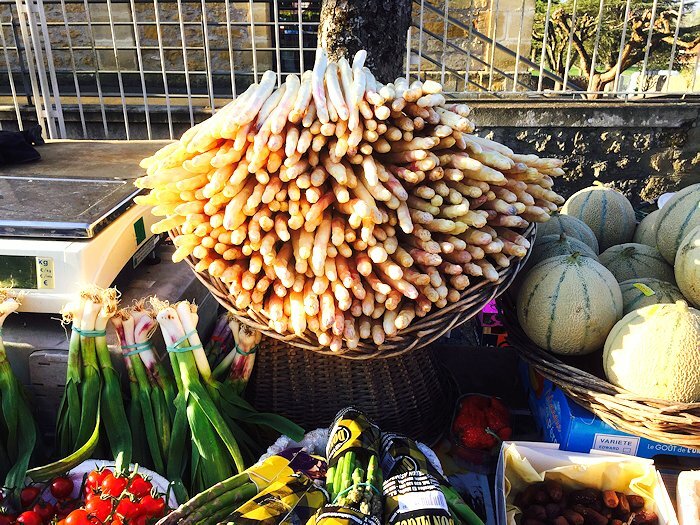 In spring the markets are stocked with beautiful, tender stalks of white asparagus. There’s green asparagus too, of course, but the white is very local to here and not so easy to find in other countries, so I tend to focus on it more. All asparagus grown in the Perigord Noir is harvested by hand and we offer translator-led visits to the local asparagus farm (during the season) for guests at Le Chevrefeuille and participants of our one-day cooking courses. Q. What are you seeing a lot of at the markets now it’s spring? A. The markets are really coming to life with new peas, broad beans, asparagus – both white and green, dandelion leaves and buds and wild garlic. Winter has definitely left because it’s all starting to happen in terms of fresh, new spring produce! It’s very exciting and inspiring for me as a chef! Q. What plans do you have for the CookDordogne menu this year? A. We always stick to what’s fresh, local and in season for our menu at CookDordogne. When the figs on our tree ripen, we’ll be doing confit de canard with fig sauce, and later in the year when chestnut season arrives, we’ll be preparing a delectable chestnut veloute. Of course, desserts are always in season in France, and we’ll be serving up everybody’s favourites: cream brûlée and fondant au chocolat… to name just two. Q. What do you love most about cooking for others? A. I love the joy a good meal gives people!